Have you noticed the number of Urgent Care centers popping up around town lately? There are thirty listed in the Kansas City phone directory. Although the first Urgent Care center opened in the 1970s, there numbers have grown widly in the past five years. The National Center for Health found that 48% of people who went to the Emergency Room did not have real emergencies. They went to the ER because their doctor’s office was not open when they needed care. To ensure proper care for urgent matters and emergencies, patients now have the option of going to an Urgent Care center instead of to the ER. Patients don’t have to treat every health matter as if it were an emergency. Business professionals don’t have to treat every issue as an emergency either. In fact, doing so can make people look like they are not in control of their work, do not know how to prioritize, and are incapable of making wise decisions. When a manager operates in a state of emergency all the time, it demotivates their teams and causes lack of trust. When everything is an emergency, nothing is. So, if we are not supposed to make everything an emergency, what’s this sense of urgency people have been talking a lot about? Pay attention. They are alert and proactive. Seek information. They are on the lookout for external information relevant to success. See opportunities. They see opportunities in challenges and crisis. Move forward. They find ways to launch initiatives, form and motivate teams, and make a difference. The sense of urgency is not created from feelings of contentment, frustration, anxiety, or anger. It is a sense of determination, strong desire to win. Urgent people realize there are obstacles and challenges—they are not ostriches with their heads in the sand—yet, they are positive and energized by opportunities. 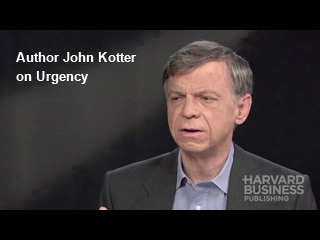 People who live in a constant state of emergency or in their comfort zones tend to focus on trivial issues and on projects with no significant contribution to the organization’s strategy. They are not focused intently on progress but on chaos or status quo. 1.Are assignments around critical issues regularly not completed on time or with sufficient quality? 2.Are discussions inward-focused and not about markets, emerging technology, competitors, etc.? 3.Are failures of the past discussed so as not to learn from them, but to stall new initiatives? 4.Are highly selective facts used to shoot down data that suggests there is a big hazard or opportunity? 5.Do meetings on key issues end with no decisions about what must happen immediately (except the scheduling of the next meeting)? 7.Because they are too busy? 8.Do people regularly blame others for problems instead of taking responsibility? 9.Do people run from meeting to meeting exhausting themselves and rarely focusing on the most critical hazards or opportunities? 10.Do people say, “we must act now”, but then don’t act? 11.Do people spend long hours developing power points on almost anything? 12.Is candor lacking in confronting bureaucracy and politics that are slowing things down? Set reasonable deadlines, keep track of them, and honor the commitments. Listen to what external resources like customers, new staff members, partners, and suppliers are saying. Understand the truth and anticipate needs. Listen to external data, in addition to the people. Identify the opportunities in every challenge and crisis. Behave urgently daily. Urgency can be developed but if it’s not used all the time, it will diminish. If you only operate urgently every few months, that’s like the college student who crammed for final exams. Watch out for the No-Nos. The No-Nos kill urgency. They say they are too busy, and they often stretch work out beyond reasonable limits. Encourage risk by not punishing failure. Fear of failure leads to complacency. Pursue winning relentlessly. Not to sound like Charlie Sheen, but prioritize actions based on their preparation for victory. Sustain the sense of urgency with courage. You’ll need courage to ask questions, nudge others forward, and lead the impending changes. Are your industry and customers standing still? You cannot afford to function in a state of emergency or in long-held comfort zones. The sense of urgency will propel your organization past this current financial state when you’re all functioning with the same sense.